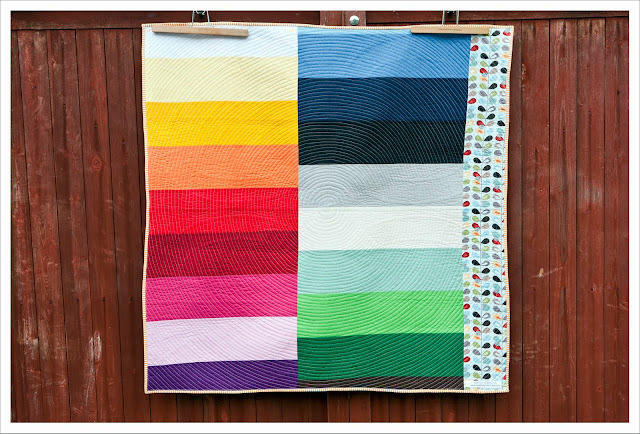 I am not sure when and why I started to call this quilt 'Single Boy Quilt' - it just sort of happened. Maybe because it is the smaller brother to the large 'Single Girl Quilt'....although that doesn't make much sense at all....anyway it is finished and another one I very much love. I spend rather a few hours quilting this beauty with quilting lines barely a half inch apart. 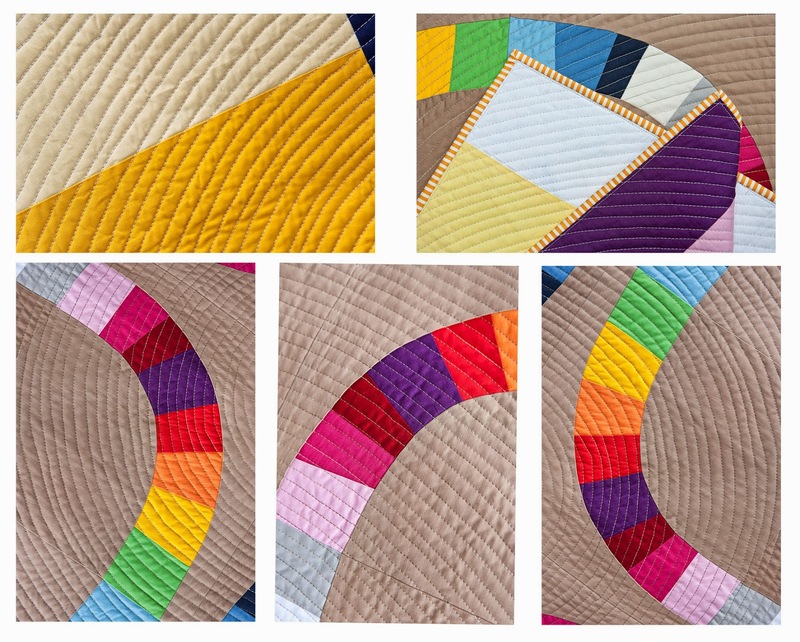 I wanted to make the continuous circle more organic and tried to vary the distance between the quilting lines but somehow most seem to be the same distance apart. And I adore the quilt back! I used up all my Klona solids I had for this quilt and because I didn't have quite enough I added a strip of patterned fabric which is 'Long Live Vintage' by Carolee McMullin for Adornit to make up for the shortage. And you know what ? The colors in the strip just fit perfectly to the rest. What a stroke of luck. 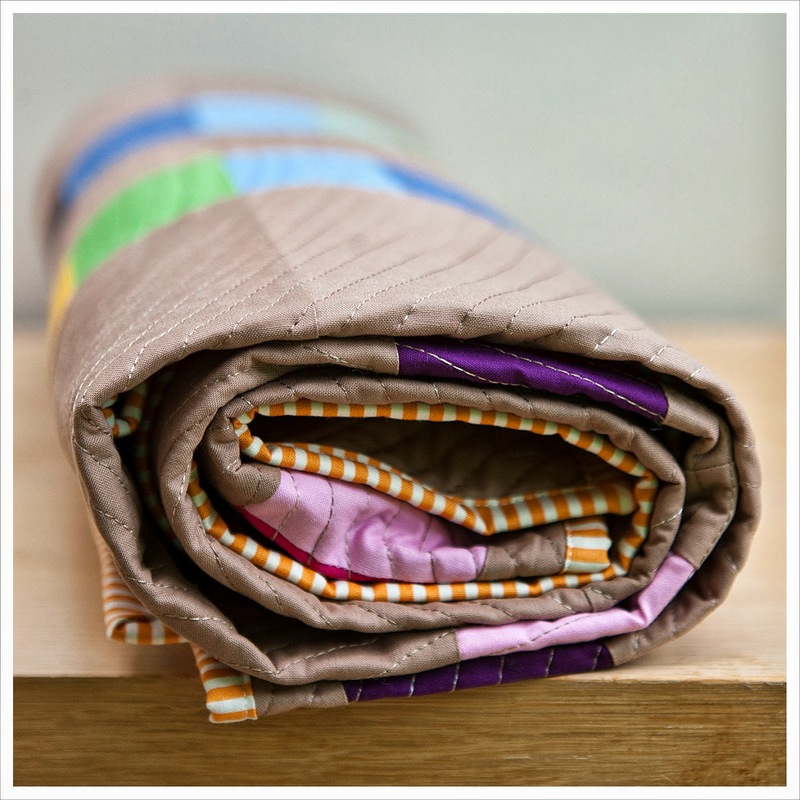 I do love a quilt that is truly reversible and I think this one just fits the bill. The quilt is 46" square and bound with a stripy number in a yellow/orange which might be from Sevenberry but I am not sure. I quilted in Güterman Sulky 30 w and used a variegated thread for the top in colour 4036 which is a beige/brown tone and for the back an ice grey from Aurifil also in 30w in colour 2600. 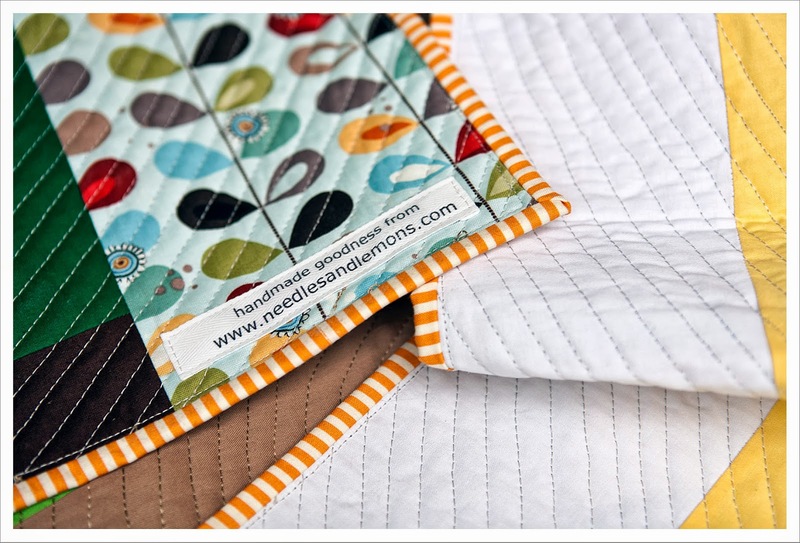 I do prefer a 30 w to the lighter weights for quilting as it brings out the quilting more distinct. 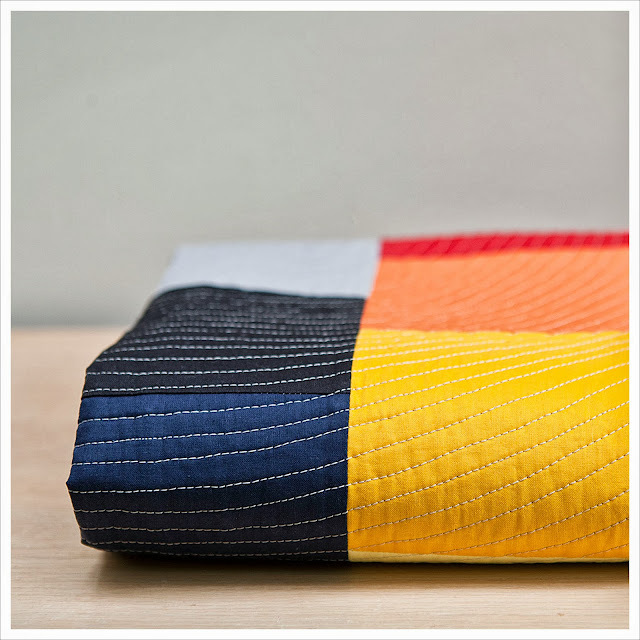 The bright solids in this quilt are Klona and are available here in the UK at Backstitch. The background colour is Kona in taupe which is widely available in the UK and amongst other at Village Haberdashery. Previous posts regarding this quilt and its bigger sister can be found here and here. The quilt is available at my Etsy Shop for purchase. Loved seeing this come together, it's wonderful! 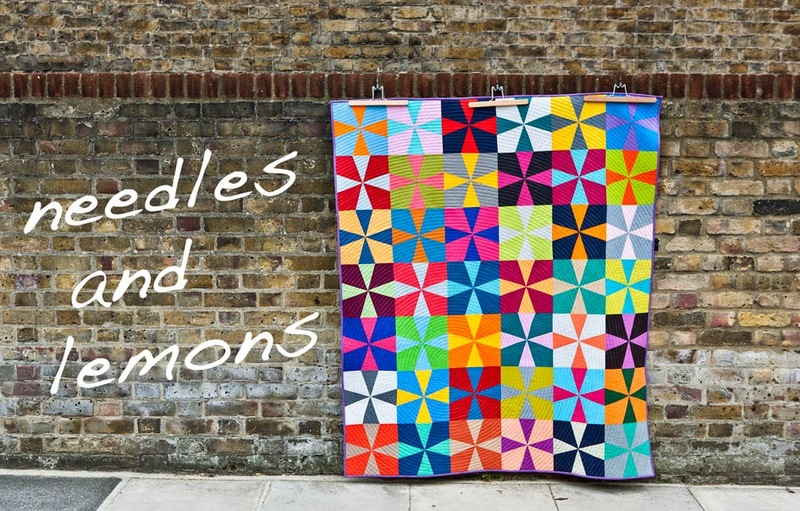 So cheery and lovely quilting too. It is absolutely gorgeous. I love the visible quilting, and everything else about it really! 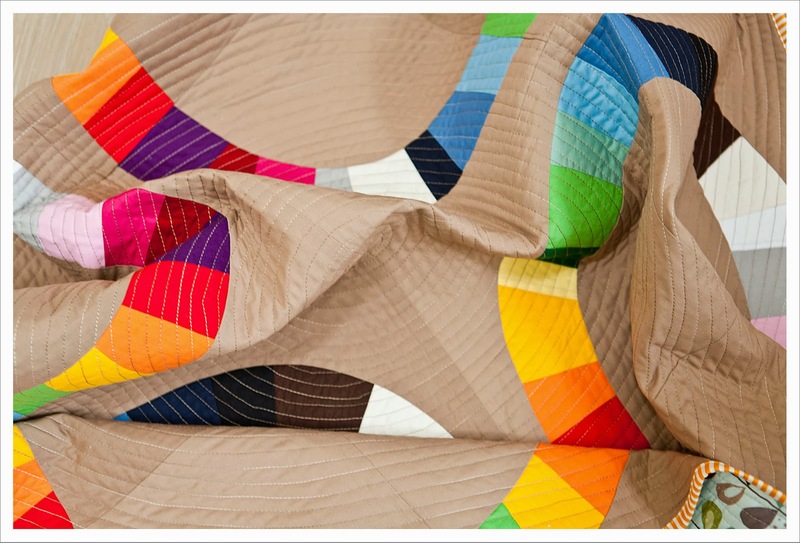 It is fabulous - the colours and the quilting ! Love the Orla Keily style print on the back. 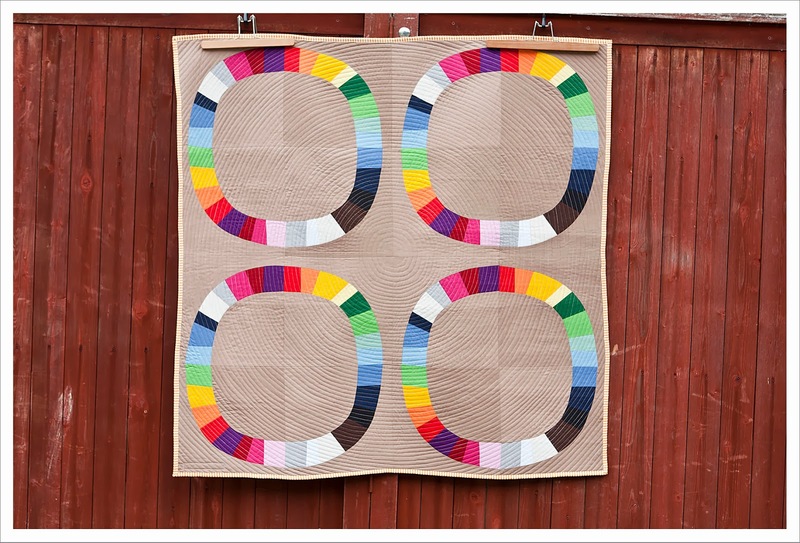 There is something about circular quilting really makes the quilt pop. I circular quilted one of my quilts and it's my favorite so far.